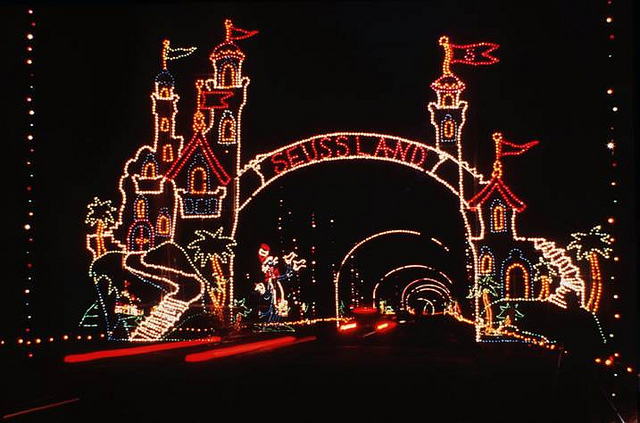 November is a slow time for the arts, but this week kicks off holiday nighttime light displays! Even if you don’t have kids, it’s thrilling to celebrate the holidays at night, outdoors, admiring thousands of lights and displays. With some attractions, you walk in the cold, but others you can stay warm in your car. You’ll find parades, lantern walks, outdoor theatre shows, and can meet Santa, the Grinch, and others. Sometimes Santa arrives by boat or fire truck. Sometimes he arrives by parachute! Some events are held at theme parks, have horse-drawn sleigh rides, ice sculpturing demonstrations, or fireworks. At some, you can pet animals — even real reindeer. Of course Events INSIDER runs the largest list of holiday lights in New England. We track 126 outdoor holiday events. Make it an excuse to drive an hour or two out from Boston and see something truly unique. To start, here are the 37 events that are open this week, hand curated and with the dates marked. (Note, many events will have a special night such as a parade or Santa visit that don’t happen every day, so check listings.) Only a few are overtly religious — most are Frosty the Snowman stuff, safe for people of all backgrounds. So don’t just go to a mall this year. Do something arty. Get out and have some fun!